French company Grosfillex, prominent for their quality summerhouse constructions incorporate the same design features into their PVC storage sheds, the difference being a more open design through the installation of larger windows tailored for summerhouse living as opposed to small windows in the doors accomplishing increased privacy for their utility shed design. If a weatherproof body wrapped around a steel infrastructure for enhanced stability in delivering storage protection are priority concerns, Grosfillex Utility Sheds are worth serious inspection. 4 sizes complete Grosfillex’s Utility Shed range, this particular facility spreads a 4.9 m² surface area relating to 2.42 metres width x 2.02 metres depth (approx. 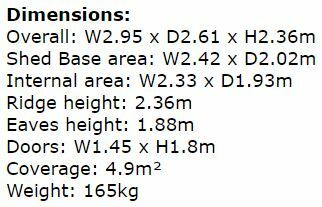 7.5 ft x 6.5 ft) across their base dimensions. The smallest model within Grosfillex’s Utility range regards the delectable mini 2.76 m² utility shed, the next size up accommodates a ground covering equating to 7.5 m² whilst Grosfillex’s largest utility sheds span 11 m². A PVC composition provides assurance in accomplishing the elimination of maintenance issues, a road we decided to embark upon after being tied to yearly re-varnishing demands, frequent re-roofing projects and so forth. Once the floor disintegrated after the rot set, our attention swayed to consider alternative solutions. A resin composition ticked most of our boxes, hence our decision. Although it’s a while ago since our resin shed purchase, the same design principles apply to the new models entering the market as far as weather-resistance is concerned however some of these new models exhibit ultra stylish displays inclusive of enhanced features upon comparison, these Grosfillex sheds are of no exception. Grosfillex sheds receive first-rate feedback relating to their sturdy construction and wonderful summery appearance of pastel shades however what sets this range apart from competing quality plastic sheds regards their anchorage system, although a built-in floor is not included this surprisingly provides huge benefits causing Grosfillex to take full advantage. The same initial principles that should be adhered to for any resin shed construction regarding laying a perfectly level substrate of solid foundations also apply to these Grosfillex facilities. Flawless foundations relate to either an entirely level base of wood or concrete for the shed to sit on. The importance of building from a level surface regards the facade panels easy plumb alignment during assembly, their perpendicular stance accomplishes the doors operating correctly plus the roof weight spreads equal force on all shed sides eradicating future leaning pressures and a slant to one side. 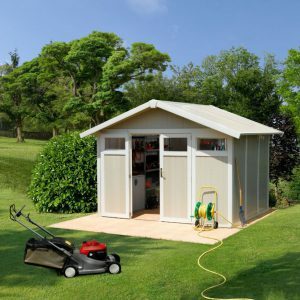 A solid substructure like wood or concrete provides the quintessential surface to survive demanding pressures associated with wheeling in heavy gardening machinery and the storage of hefty items plus it provides the ultimate substrate for rigidity in securing the shed down onto the ground. Common on the majority of competing plastic sheds where anchorage regards securing anchor bolts through the anchor placements within their resin floor, Grosfillex take on a rather a different approach by anchoring their mainframe down into the ground. This is due to their summerhouse design where the purchaser fits their preference of flooring to coincide with their required garden room’s services. Traditional wood decking or concrete foundations will however provide the appropriate surface demanded by utility services. Upon completion of their assembly, Grosfillex illustrate how to apply sealant around the internal side of the shed’s perimeter to fully waterproof the shed, pretty basic stuff for a novice DIYer however everything associated with their construction is fully demonstrated in the instructions. Grosfillex enhance sheds anchorage to another level when comparing alternative resin sheds. Running around the shed’s perimeter regards their steel framework to which the corner posts and steel struts adjoin securing the facade’s wall sheets. Anchoring placements at various positions running around the shed’s perimeter secure the base framework down into the solid foundations below in addition to the triangular anchorage plates that secure the corner posts with the base framework down into the ground, situated in all four corners. Additional Anchor Kits are usually supplied (check with supplier), purposely designed for exposed areas their increased bolstering method reinforces the already in place anchorage system to survive the storms, increasing wind resistance levels many fold whilst enhancing their overall stability. Anchor kits consist of steel cables, clamps, tensioners and quick links. 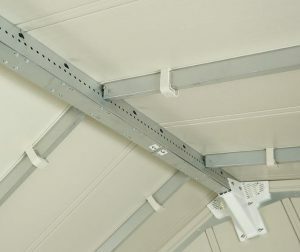 Assembly is made easy, they inconspicuously hide within the corners of the shed whilst installation regards adjoining the steel cables to all four corners of the shed and tightening the shed’s overall tension down into the ground. A very cleverly designed anchorage system, exceptional reviews flood back regarding Grosfillex’s all-embracing methods of delivering a sturdy construction. This roofing structure certainly provides the distinctive appearance of a Grosfillex shed, their lavish extension surpassing way beyond the facade averts any possibility of rainfall seeping inside where the walls meet whist the 20° angled pitch of their apex design delivers rainfall an immediate drainage escape route. Inside there’s an abundance of spacious internal headroom, comfortable for an adult to move around with ease due to Grosfillex’s homely summerhouse design being absent from a steel truss system stretching out across the rafters and skylights embedded within the roof-ridge delivering daylight, a common sight seen on most competing plastic sheds. Instead, Grosfillex deliver their main roof support by inserting a steel beam running the full length of the shed within the apex roof-ridge to where all the roof supports adjoin thus creating the roof’s strong infrastructure, able to survive winters heavy snowfalls. For their summerhouse design, larger windows are incorporated to deliver an abundance of daylight to the interior however for utility services such as this, small windows in the doors deliver more privacy along with adequate daylight. PVC sheets make-up the roof expanse by securing to the steel struts that adjoin the roof’s steel ridge-beam. Their manufacture boasts the advantages of polypropylene resin, being impermeable to rainwater and resistant to decay therefore unlike roofing felt’s rapid deterioration when damp conditions attack leading onto frequent re-roofing dilemmas, polypropylene resin resists decay entailing in a future absent from re-roofing projects. 26 mm thick PVC panels make-up Grosfillex’s facade sheets. Captivating interest, their polypropylene resin manufacture delivers virtually maintenance-free benefits due to polypropylene’s resistance to weather decay, absent from duties associated with re-varnishing and re-painting demands nor the replacements of rotting panels. Grosfillex design their sheds and summerhouses into the most desirable picture perfect displays. Summery shades of pastel blues and greens etc are eloquently produced by their heliographic printer whist the molding procedure delivers the vertical panelling attraction. All what’s now required now is a steel infrastructure for enhanced rigidity to which the facade panels secure to, Grosfillex deliver this by securing the facade panels to the vertical metal struts displayed in white within the imagery, these simultaneously secure to the base and top steel infrastructure. Although polypropylene resin delivers a make-up able to survive damp and wet conditions, as much attention to detail to withstand decay has gone into providing a manufacture armoured with UV protection to survive plastic’s inherent problems regarding surface splitting and the demise in appearance a bleaching effect succumbs to when exposed to sunburn attack. Grosfillex sheds are 99% recyclable, manufactured from environmentally friendly thermoplastics whilst their surface is a doddle to clean. Most people just lightly spray-hose them down, a procedure we partake in on a summer’s evening whist watering the plants. Maintenance used to be a frustrating job, not any more. I find giving our shed the rapid whirlwind wash quite a fun job & it’s done in minutes. Built-in grime can soon be shifted by a adding white vinegar into a warm soapy bucket of water and scrubbed off with a soft brush, many other light detergents will accomplish the same results, followed be a quick spray-hose down. Grosfillex advise not to use anything too abrasive in fear of marking the facade. Grosfillex incorporate six air vents, one into each of the top four corners plus another two within the apex peak front and back to generate a continual air current to the interior, this accomplishes the eradication of a sweaty environment developing whilst removing the escalation of internal condensation build-up during warm weather, enhancing storage preservation qualities derived from a fresh internal ambience. Although many people like ourselves install free standing shelving to exploit the shed’s generous height in accommodating hefty gear, Grosfillex provide mounting kits to enable fixing shelves plus this wondrous design allows hanging long handled gardening tools against PVC manufactured walls. 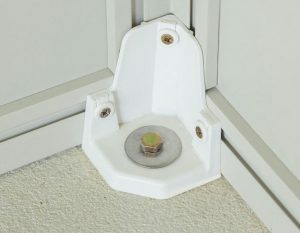 Mounting kits are usually included (check with supplier) and come in six sections. Each section fits within the grooves of the steel struts and secures into place with screws. These sections allow screwing into for the installation of shelves and hanging items against the walls. Great design feature. Windows in the doors enter adequate daylight for utility services whist their traditional key lockable handle and metal hinges not only deliver a quality opening and closure, when shut and locked with a key, security standards are increased many times in comparison to those secured by a padlock and clasp. Impressive security here! Assembling a Grosfillex utility shed or summerhouse is made very straightforward once the perfectly levelled solid foundations are in situ. Constructing a Grosfillex regards following the order of procedure stepped out in the instructions and implementing what’s shown represented by illustrations. Two people are necessary for construction, one secures the panels whist the other plays a supporting role. A step ladder and movement around the base perimeter is essential for fitting the roof panels. Many people accomplish the build in a day, others take two; dependant on one’s DIY skills. 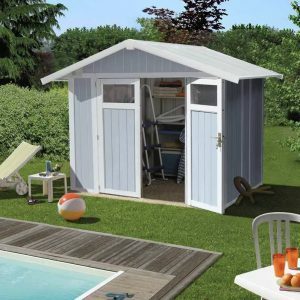 Grosfillex 4.9 m² Utility Sheds exhibit delectable pastel shades, designed with accents to complement any garden’s outdoor scenery. Their weatherproof design resists decay eliminating future’s conservation issues accompanied by a surface that’s such a doddle to reinvigorate their shine, accomplished by a swift hose-down. Grosfillex sheds are absent from a built-in floor due to their summerhouse design however by preparing the correct solid levelled foundations and sealed internally as illustrated in the instructions represents no problems. The way the mainframe and corner posts secure Grosfillex sheds down into the ground combined with their additional anchorage kit consisting of steel wires and tensioners is a very impressive anchorage system. The reinforced roof support delivers spacious internal headroom expanse whist ensuring efficient rainwater drainage outside caps Grosfillex’s off to stylish effect. Impressive designed Mounting Kits aid internal organisation, key lockable handles enhance security measures whilst double doors provide fab access. 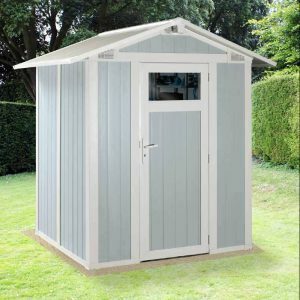 There’s a plethora of advantages choosing a Grosfillex design, they are masters in delivering attractive, low-maintenance, sturdy quality summerhouse constructions. A 10 years limited warranty coupled with exceptional feedback provides confidence in their designs. Thanks for reading about Grosfillex’s 4.9 m² Utility Sheds. If you have any related PVC shed queries, please ask in the comment section below. I’ll do my best to answer. Please share this post with your social friends. Thank you! Wow these sheds look really great! I love the idea of PVC and the aesthetic look of the sheds is very homey! I have been wanting (needing) a shed for some time, but just didn’t like the look and feel of the old metal buildings. These sheds look like they would fit into anyone’s yard! I also love the idea that it is made from recyclable materials. Great job on reviewing these sheds! Could you put the prices of the various sizes on site? Thanks! 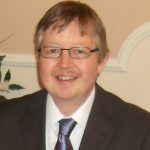 Thanks for dropping in and reading about Grosfillex’s PVC storage sheds. Yeah, homely certainly describes Grosfillex’s interiors as their huge expanse of spacious ceiling height is absent from steel girders spanning across the apex internal width, a sight seen on competing quality plastic sheds for their reinforced roof support, Grosfillex have a different construction due to their summerhouse design, incorporating identical features into their utility sheds. I understand your views regarding metal sheds, we wanted to escape the unsightly appearance dents display due to their flimsy skin and preferred double opening doors rather than a slider for better access however their security usually beats the plastic and wooden variety. Grosfillex on the other hand surpasses the security standards on metal sheds in my view with their key lockable handles. 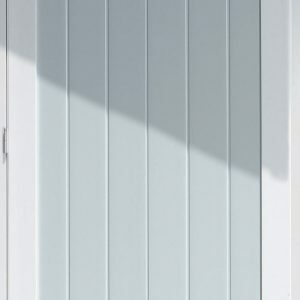 Grosfillex sheds are manufactured from 99% recyclable environmentally friendly thermoplastics and like you mention, they do have the most idyllic appearance exhibiting summery pastel shades around their stylish design. Here’s the prices section: I have placed red links to prices in-among the reviews, to stand out however I don’t ever want this website to appear as a sales site with loads of prices scattered throughout the post. We just like to provide the information visitors are looking for prior to making an informed decision & purchase, then they can click the link if interested. Thanks Simon for getting back with me. I am definitely going to check into these some more come spring! Hi Brenda, glad to be of assistance. Spring is the best time to construct a shed, I agree. I would bypass the construction process in winter, that’s for sure however building a shed/summerhouse in early spring provides use and services for the rest of the year. Great idea.